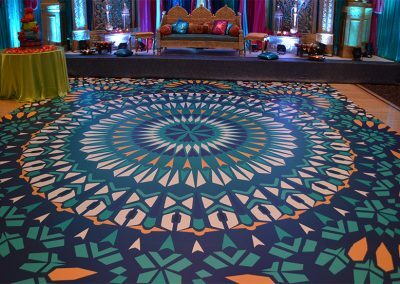 Let’s transform your boring dance floor to a beautiful mind-blowing center of attraction graphical flooring beyond your imagination. 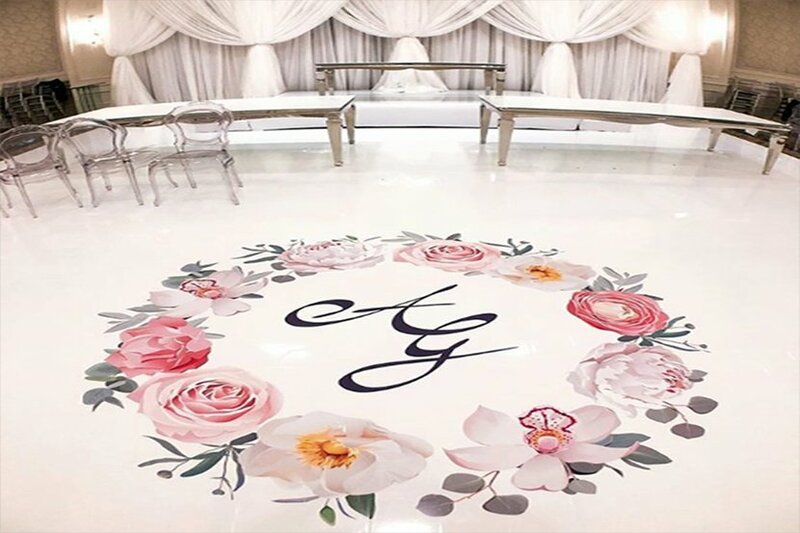 There is no doubt that the dance floor at the wedding reception is one of the best places to be, but that ordinary tile or wooden floor can do so much more to decorate the room and make your wedding reception truly unique and special. 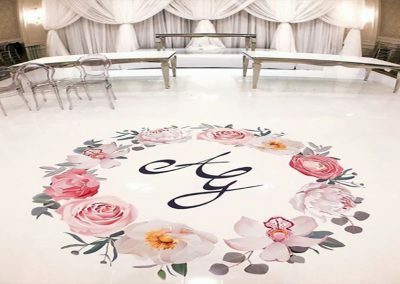 A professionally applied vinyl dance floor wrap creates a personalized place to share all those important first-time moments. 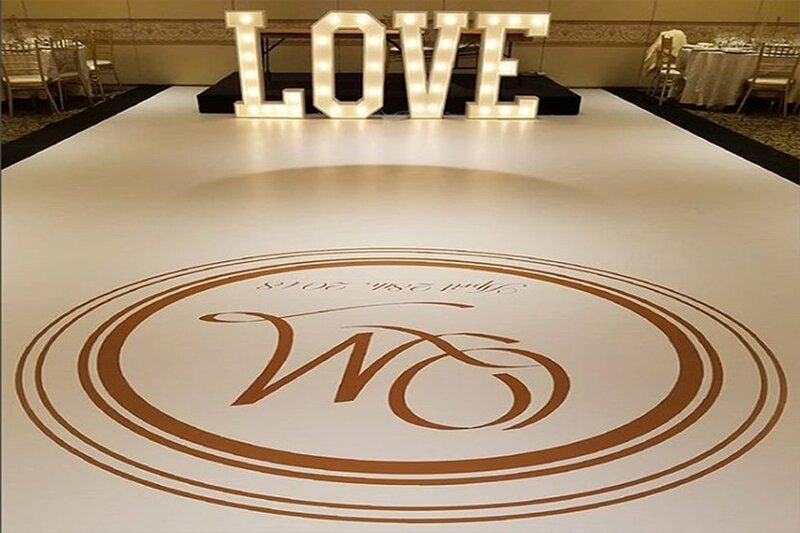 FM Wedding & Event Productions offers an extensive range of floor wrap styles to suit any design ideas. 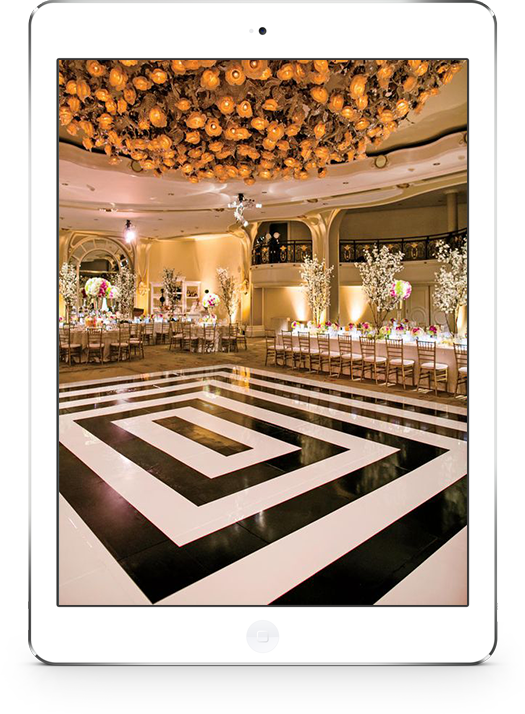 Our DJs are hand picked by us for their ability to mix and read the crowd. 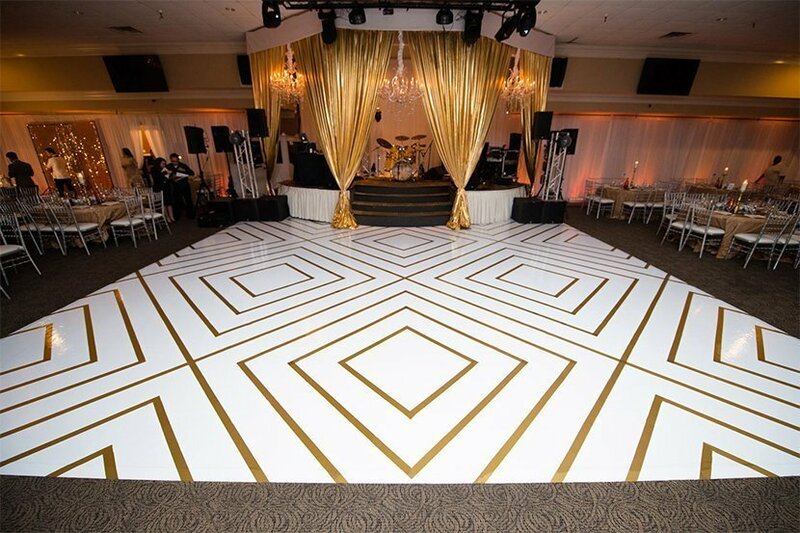 If you want everyone dancing, we can send your guests home with sore feet! 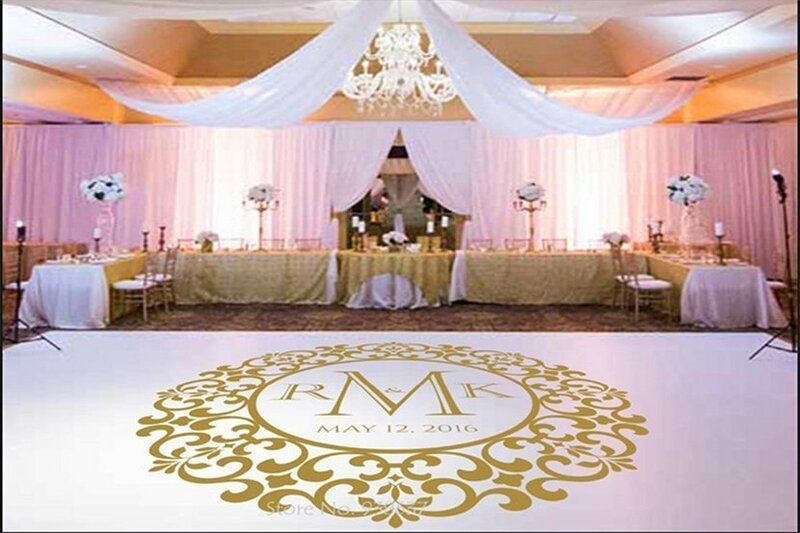 We are a one stop shop, offering professional DJ, lighting, photo booth, and special effect services. 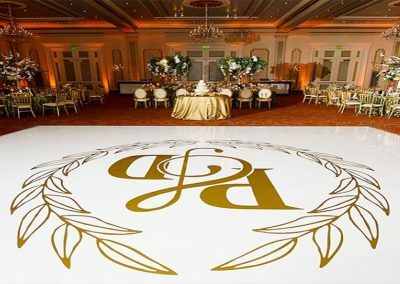 We also offer oak and vinyl dance floor, drapery & gobo monogram projections. 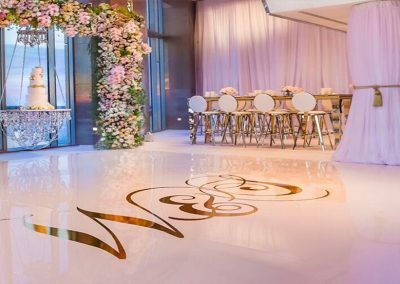 Most wedding receptions feature a special new married couple dance to highlight the start of the bonded relationship in the most romantic way. 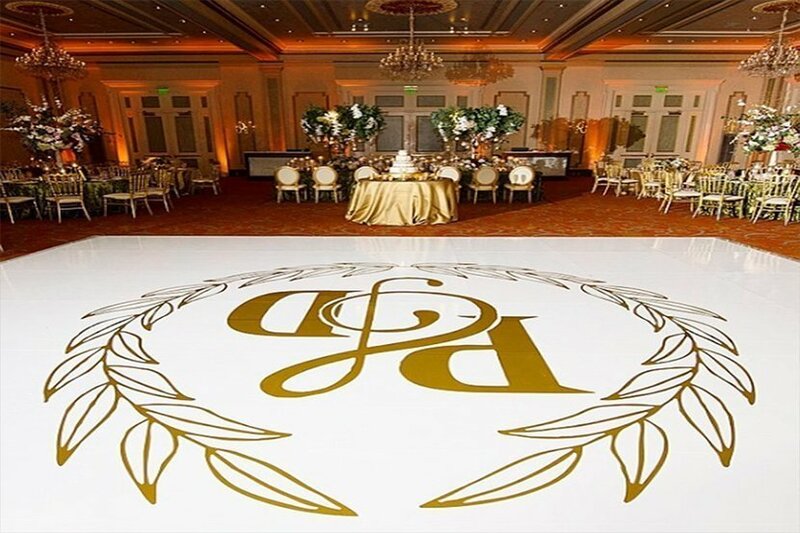 There may be father-daughter or mother-son dances, special ones for just the wedding party or close family members. 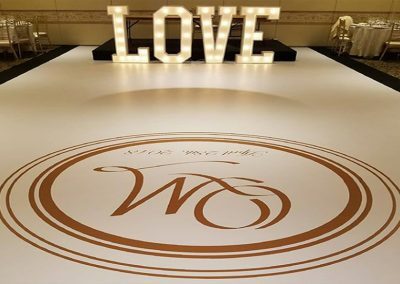 Of course, the dance floor also opens up for all the guests to enjoy a loving slow dance with their loved ones and place to let their hair down and have fun as the night goes on. 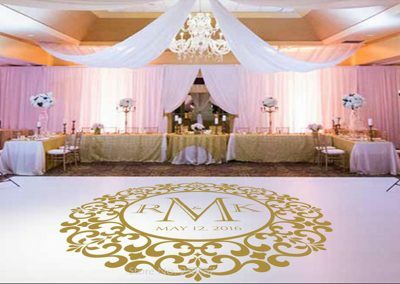 Vinyl dance floor wraps for weddings come in a variety of colors and graphic designs from modern geometrics to vintage style flourishes. 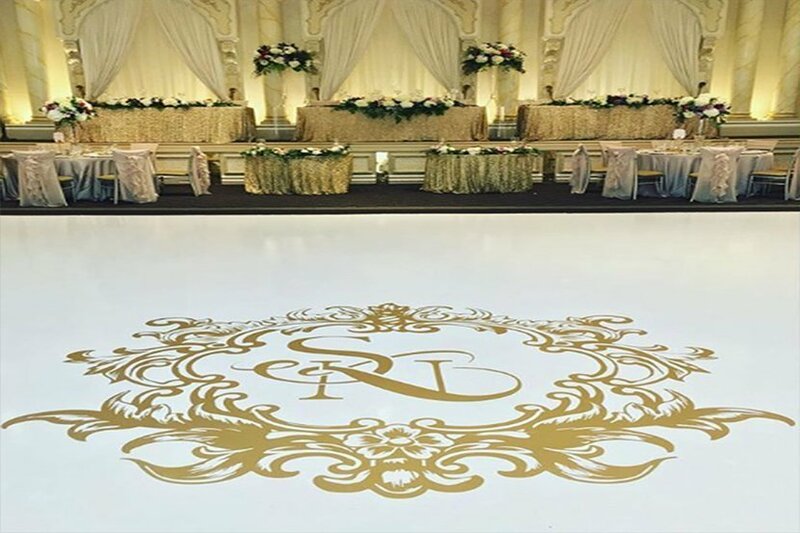 One of the most popular styles of floor wrap is a bold and elegant monogram to celebrate the newly married couple. 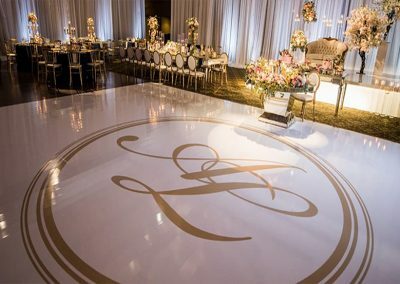 What could be better for the romantic first dance than a truly unique dance floor celebrating the loving bond being honored there that day? 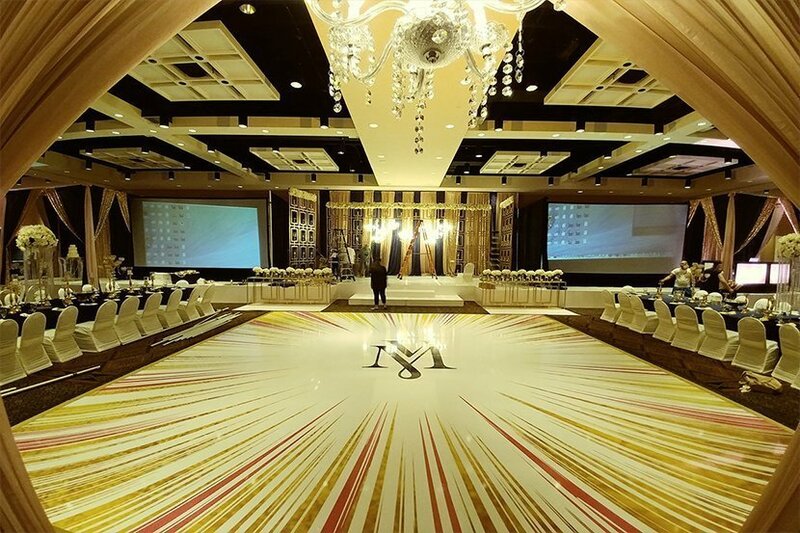 FM Event Productions is the best! 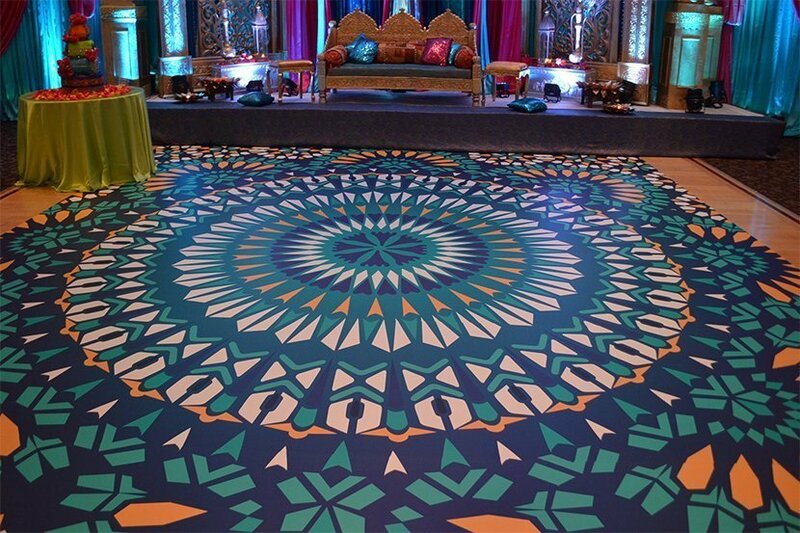 DJ FM was EXCEPTIONAL and everyone danced all night. 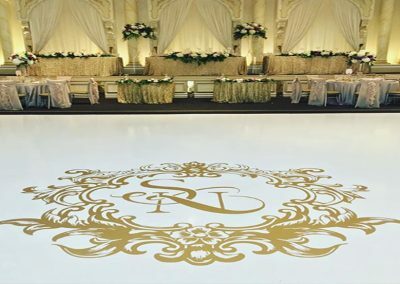 We had an endless compliment and some guests even asked if he had a copy of the playlist because it was so good. We are so glad we hired FM to DJ our wedding. 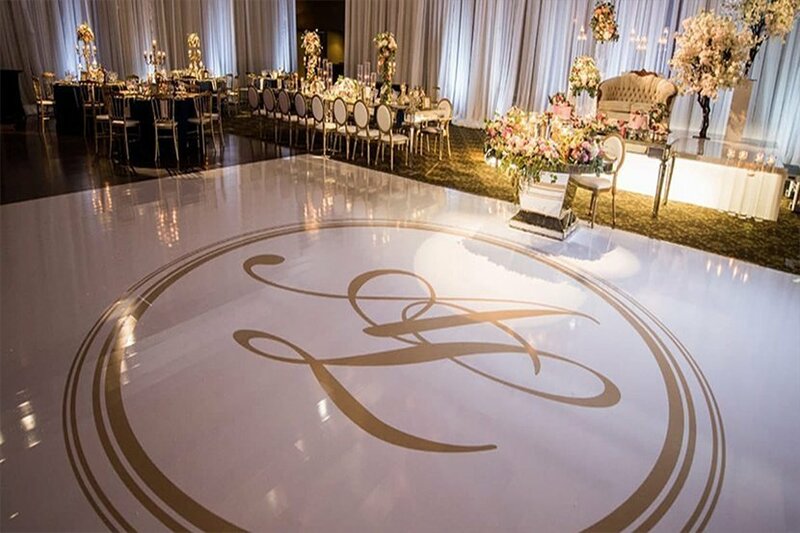 He was the perfect DJ and kept the wedding moving with the perfect enthusiasm. He also kept checking on us to see if we needed anything and truly worked hard to make our night perfect. 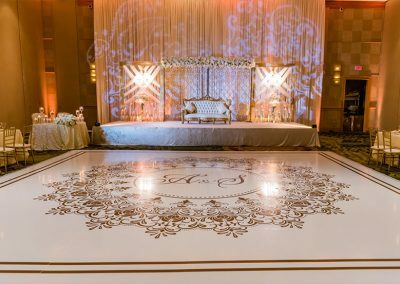 Don’t think twice, hire now! 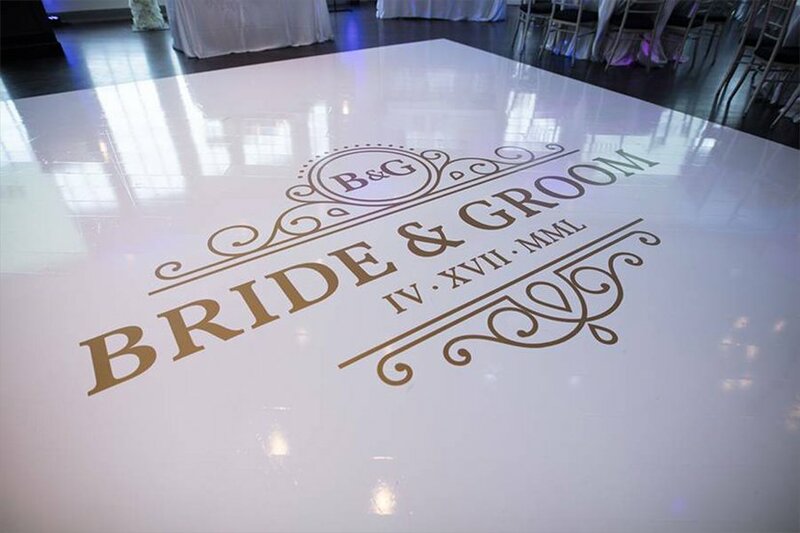 Work with our design experts to choose the best vinyl floor wrap design for you and your party. 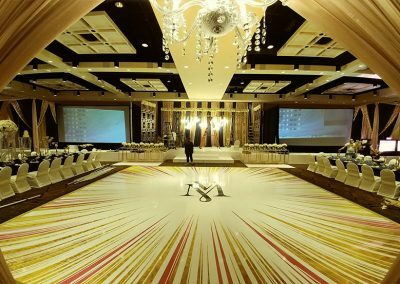 DJ FM technicians handle installation before the event begins so everything looks perfect by the time the first guests arrive. 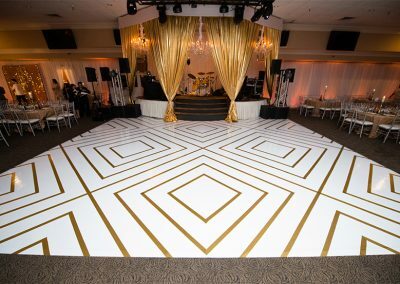 These vinyl wraps install securely, safely, and temporarily so no damage occurs to the venue’s dance floor at all. 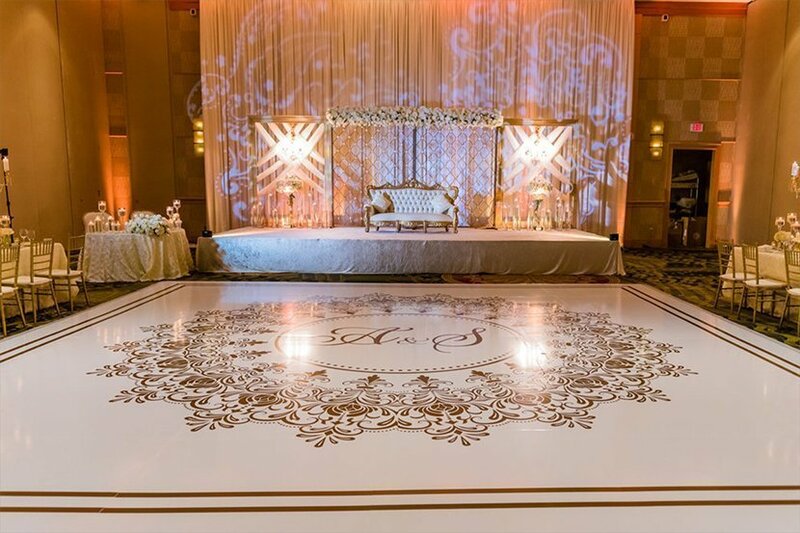 There is no added risk of tripping or slipping while you or your guests try out the best dance moves. 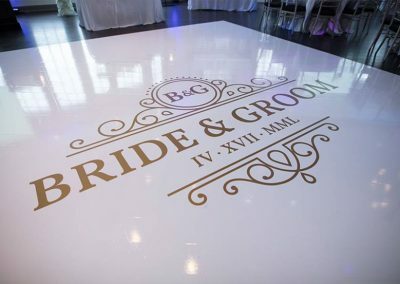 Vinyl dance floor wraps are the perfect way to add a custom look to the reception room.